My work on computing student employability, along with my wider interest in entrepreneurship, puts me in regular contact with companies of all sizes. In recent years, I’ve developed a particularly affinity for technology startups. Technology startups are useful places for students to work and gain experience. For those students who are willing to take the risk, the rewards of joining a startup in its early stages can be huge if the startup takes off. I was able to attend the Startup Grind Europe 2016 conference, a one-day event aimed at bringing together startups of all sizes for a series of presentations and what were called fireside discussions (read, structured chat-show style interviews in front of a live audience). Startup Grind Europe was an interesting experience. I met some cool people, including several wanting advice from an academic perspective, or looking to see if I was suited as an investor. One disappointment I did have was that I totally failed to encourage any computing students to attend with me. That was a shame, as there were certainly jobs and internships on the table, as well as many tips designed to help students when they did progress to look for employment or to launch their own startup. I collected some of my immediate thoughts (read my tweets) from the day in this Storify. There were no shortage of interesting nuggets of information shared, but I want to pick up on three areas that should be of particular interest to students looking to progress their career within the startup scene. I keep seeing the same so-called disruptive ideas looking to match candidates with potential jobs come up again and again. I spoke to two main players during the conference who wanted to tell me how this was their business plan. I spoke to another similar startup a couple of weeks back. I also saw a further recruiter exhibiting at the event, although I didn’t capture the details of how their technological solution worked. On top of this, I know of a student who worked in a company moving within the startup space matching jobs and candidates several years back. The current premise seems to be that data-driven recruitment is the way forward. Now, it’s not long since this type of recruitment just included automated scanning of candidate LinkedIn profiles in order to find those who might be a match for a particular job. The latest systems are more sophisticated. For example, they use personality tests to recommend companies for people to work for, or they analyse how closely a candidate will fit within company culture based on the information they’ve published on social media. The main differentiators within these startups seems to be in the size and type of their user bases. These include both people wanting employment and the companies they’re working with who offer employment. For instance, several startups now focus solely on the job-hungry student market. Others focus on a particular type of employers. Marketing employees to other startups also seems to be in vogue. To me, this does rather suggest that startups have more money to spend than I would otherwise have assumed. There may be a startup market here, but my recommendation is that this area is just too crowded for anything other than for an idea that is really original and tightly marketed. I also overheard a discussion where people I took to be potential startup investors were expressing the same concern about overexposure regarding dating sites. Several speakers stressed that the first employee of a startup needs to be very carefully chosen and that this person would likely make or break the future success of the startup. Other speakers discussed the difficulty of finding employees who possessed the necessary skillset, generally requiring both technical and business skills. You might think that startups would provide an ideal opportunity for students, but for many, this is not the case. The challenge here is that most students are not all-rounders and many of the most technically able graduates have no interest in moving into a combined role like the one being requested. The best graduates are also snapped up by the traditional companies. The idea that every student is a potential entrepreneur and is interested in the startup world is often pushed, but it’s a false one. What that does mean is that students who do want to join leading startups at an early stage, perhaps as a Chief Technical Officer, should be looking to identify their weak skill points and correct them. That may mean gaining additional programming experience, but more likely, this means engaging with the startup culture and developing the skills needed to pitch and present. I’ve covered the benefits of hackathons on the blog several times and these offer an excellent way for students to simulate the skills needed by startups, as well as to provide for CV enhancement. I was one of the first people in the UK to promote the need for students to have a developed professional online presence and to use this to present themselves positively on social media. Since then, I’ve provided many staff development workshops on the subject, developed podcasts to help students and published findings as academic papers. For Computing and Computer Science students, the need for a developed professional online presence and portfolio is even greater than for many others students. That’s one more reason I’ve encouraged students to work on open source projects, develop software at hackathons and publish on Github. 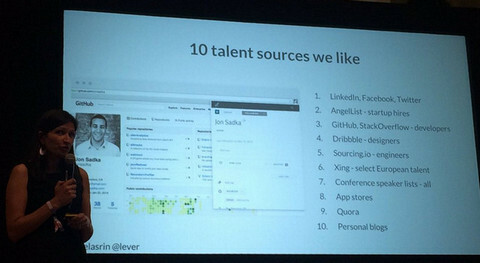 During the conference, Leela Srinivasan from Lever listed the 10 sites that she believed best for finding talented employees to work on students. Students looking to work for a startup or for summer experience could do far worse than reverse engineering this list. As well as being visible online, having even a simple app on an app store demonstrated additional skills and the difference maker mindset that so appeals to startups. Posting valuable technical information online is also a good indicator of student talent. I do have to stress how valuable events like Startup Grind are for students and for startup companies, but they are also valuable to others on the fringe side of those movements. Just tweeting at an event like Startup Grind is an excellent way to grow a professional reach. It helps to share the event with people who couldn’t attend, helps to promote the companies involved and helps with the development of professional contacts. And, I can tell you that the reach from many of my tweets was massive. I’m continually interested in working with startups, consulting with them, providing access to students and helping students to gain opportunities. For companies looking to share the knowledge that they’ve gained during their startups, student (and academic) audiences are also perfect for that. Feel free to talk to me if I can help further.